You’re probably not thinking enough about your CTR, most people don’t, but it’s an important factor. 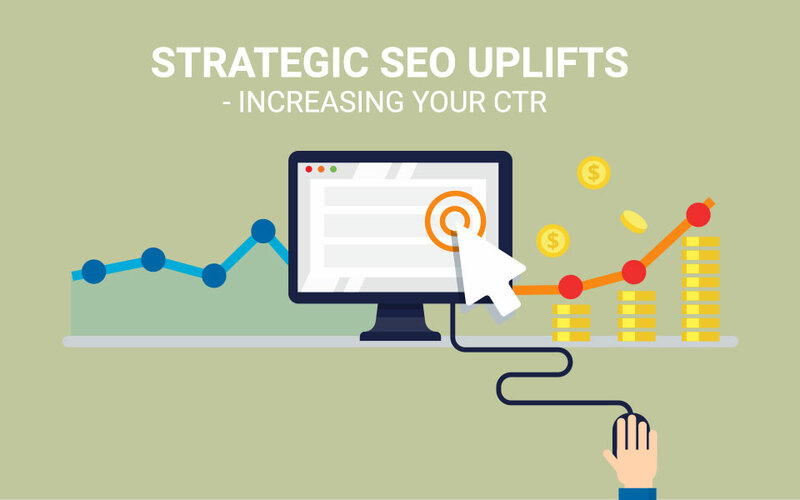 After all, if you increase the number of clicks, your traffic increases, your rankings might increase (leading to more traffic) and you get more purchases and longer engagements. More purchases and longer engagements make you very happy, right? This is all on page 1 of Google, need we go on? Anyone searching those terms is also likely to come across your page, but you’re also facing a lot of competition. Your other options are: “modified broad match”, “phrase match” and “exact match”. In Adwords, Modified Broad match gives you the chance to lock in a keyword (by adding the + parameter before the locked word) but may drop other words in the phrase. Phrase match will include your exact phrase and may add words before or after it, but not include synonyms. So your ad for ‘luxury office chairs’ won’t show up in searches for ‘luxury office furniture’ but would show up in a search for ‘discount luxury office chairs’. You’ll get more specifically targeted traffic, but you also risk missing a lot of potential traffic who you could upsell to. Finally, we have the “exact match” which does exactly what it says on the tin, your site or ad will only show if someone googles your exact phrases, no additional or subtracted words and no synonyms. You’ll get traffic that is almost definitely looking for a product such as yours, but you’re going to miss everyone who is just browsing. I hope you can see how thinking about the PPC match types can help you in organic search? Even if your products are very similar, you should be titling them differently to test what works. It’s not enough to just reorder the words in your headline, and just adding different punctuation is definitely not going to make a difference. If your titles are along the same lines every time, it’s time to switch things up a bit. If you’re always talking like a hero, try being the villain, instead of telling someone what to do, tell them what not to do… the list goes on, but you get the idea. Approaching similar content from multiple perspectives gives you more ways to sell it, so be your own devil’s advocate and remember to test, test, test. Google gets asked a lot of questions, so sometimes, having an answer for your headline is the best option available. This means sticking to declarative sentences, tell your audience what visiting your site is going to do for them. Be bold and confident, try using words like: best, greatest, worst, stop and avoid. Customers want results and they want them quickly, so give them what they want, and then hook them into the rest of your amazing content and products after. You may also be able to provide your answer, or at least the promise of an answer, in your meta description to get people click through to your pages. Finally, no one likes to know that they’re being emotionally manipulated, but it happens to all of us, every day. Adverts make us: amused, happy, angry, guilty and inadequate — sometimes all at once. Think about every animal charity advert you’ve ever seen on tv, they usually start with a close up of the animal, then show it in terrible circumstances, and then they show how your donations can make a positive difference. So that’s you: sad, angry and hopeful all in one advert, and this doesn’t just happen with charities. Your favourite clothing brands do it, so does every supermarket; it’s not enough to show a product, you also have to show how it will benefit the consumer’s life. So choose an emotion, and find out what search terms will (ethically) trigger it. But don’t try to be ridiculously unscrupulous about it, no one wants to be responsible for the next Kendall Jenner Pepsi advert. Increasing your CTR by 100% won’t necessarily increase your conversion rate by 100%, but it will boost it your engagement and help you reach a wider audience. Once you’ve got them to your page, it’s time to focus on your content and products; CTR is only the first step after all.